Taking continuing education classes can help Boomers remain active and sharp. Those born in the Baby Boom generation are now 52 to 70 years old. Many of them are retiring from their careers or from jobs they have held for many years. But they aren’t just retiring to the golf course or the senior citizens center to play cards. More seniors than ever are spending at least some of their retirement or free time in the classroom. While a few Baby Boomers go back to college in the traditional sense — to earn a degree — most are taking continuing education courses on a more informal basis. Turns out, Baby Boomers aren’t interested in letting their brains stagnate or resting on their intellectual laurels. They have always had a great deal of curiosity about the world and everything in it, and retirement hasn’t changed that at all. Continuing education courses can be a way for spouses to connect. While going back to college to get a degree may not be common among the Baby Boom generation, there are many reasons why they would want to take classes, whether or not they plan to continue working. –To update skills for a job. For some Baby Boomers, work continues to be an important part of their lives. One way to show their continued value to an employer is to be sure that their skills remain updated and that they have an understanding of the latest practices in their profession. –To fulfill a lifelong dream. Many people hit retirement age and realize that they never did some things they always wanted to do. Continuing education classes can provide the opportunity to accomplish these dreams, which can be as incredibly diverse as Baby Boomers themselves. –To share experiences with loved ones. Another reason to take continuing education courses is to gain a greater understanding of your spouse’s or partner’s interests or career. Some people even take a course together to give them something to talk about over the dinner table. –Just because they’re curious. After retirement, Baby Boomers may finally have the time to pursue interests that they never could take the time for when they were working. It can be an exciting time of life where they have time to do the things they always wanted to do but couldn’t because of work or family obligations. It might seem strange that so many Baby Boomers actually want to go back to school, but they have always craved intellectual stimulation. 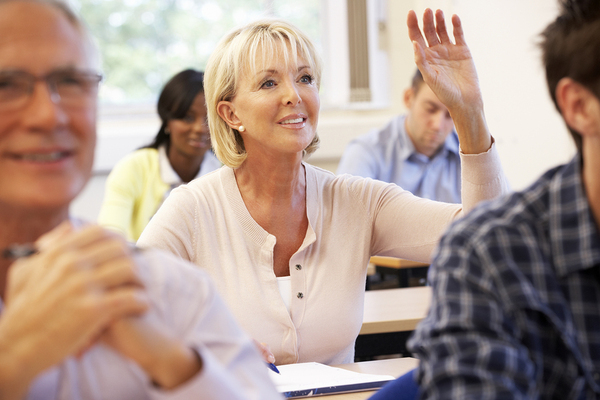 Continuing education classes make it possible to satisfy their needs for continued mental workouts while pursuing all their other interests in work or retirement. Central Connecticut State University offers a variety of continuing education classes and Life & Leisure events that are open to all ages. From computers to social media, it will be easy to keep up with kids and grandkids or that young Millennial at the office. View our open courses list to see what options you have for continuing your education.